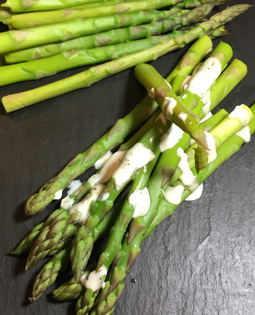 Asparagus with Umbria Aioli - A recipe from Savor California, the online showcase for extraordinary gourmet foods and beverages from California. Mix mayonnaise, lemon juice and Umbria Dip Spice together thoroughly. Allow to sit while the asparagus is cooked. Steam or parboil the asparagus, so it's still a bit crispy. Drizzle the aioli over the cooked spears. - Mix the spice with just olive oil for dipping. - Toss asparagus spears with olive oil and Umbria Dipping Spice and roast for 12-15 minutes in a 400-degree oven. - Or for a bit of char, grill the spears with the olive oil and spice coating under the broiler or on a grill.